If you can't remember your iPhone backup password that iTunes is asking for, here are a few different ideas to help you remember or find it! Note: You can test passwords in iTunes by trying to turn off the "Encrypt iPhone backup" checkbox, or by trying to restore the backup (do this only if you want to restore a backup). You can also test passwords in any of our software. Both techniques have no limit on the number of passwords you can try. 1. Try various old passwords. Your iPhone backup password was set when the "Encrypt iPhone backup" box was checked and turned on in iTunes. From there, the encryption password setting "moves forward" on to your new iPhone when you restore the encrypted backup of your old iPhone to your new one. So you may want to try some of your older passwords if it's been some time since you checked that box. 2. Try an old Apple ID password or old lock screen passcode. In some very old versions of iTunes, the prompts to set up the backup password were unclear. It was common to accidentally enter your lock screen passcode at the prompt, or to enter your password for your Apple ID. Playing on the previous section that your backup password carries forward when you setup a new iPhone from an old iPhone backup, old Apple ID passwords or old lock screen pass codes (the digits you would use to unlock your iPhone) may help. 3. Try A "Cut Off" Version of your password. Prior to iOS 10.2 (approximate), if you entered a password that was longer than 15 characters, the password was truncated and only the first 15 characters were used. If you have a long password, try entering only the first 15 characters of that password. 4. Ask your System Administrator. If the phone was setup by your work IT department, they may have also set up the password for your encrypted backup. Typically MDM/configuration profile enforced backups prompt you to set up a password at the first backup, but it's possible your admin made that first backup. 5. Try the Blank Password. We've seen some other third party software silently set the backup password to a blank/empty password in order to turn on encryption for you. If you've used some tools like this in the past, you should test the blank password. You can do this in any of our tools by just pressing the Ok button without typing anything into the password box. On Mac, you can use the Special Characters or Emoji & Symbols tool to help you "type" a blank password into iTunes. 6. Look in the macOS Keychain Manager for your iPhone backup password. Open the Keychain Access app from Applications/Utilities or by searching keychain in Spotlight. Select the "Keychain Access" program search result. In "Categories", select All Items. Search for iPhone in the search field in the upper right corner. Note: If iPhone gives you no results, try searching for iOS, iPad, iPod, or just backup too. If you see an "Application Password" named "iPhone Backup" (or any of the iOS/iPad/iPod backup variants) double click it and select "Show Password" to see the password. You may be prompted for your macOS password to get permission to see the backup password. 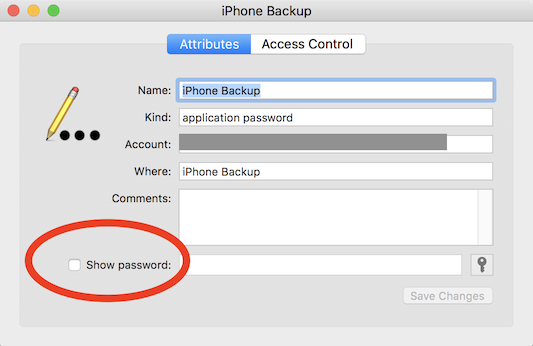 As of iOS 11, Apple has added a method for removing the backup password from an iPhone. This is not useful if you're trying to get into an old backup, but great if you've got a backup password set for your current iPhone and need to remove it for new backups. In order to clear the backup password encryption setting in iOS 11, you'll use the Settings app to reset all of the settings (but not content!) I like to make really really sure that I emphasize that in these instructions we want "Reset All Settings" ABSOLUTELY NOT Reset all Contents and Settings, which deletes everything on the iPhone. Which we certainly don't want. After doing the settings reset, make a new backup, and it should be unencrypted.